Samuel Saiz, expected to get a chance for Leeds United against Port Vale. After seeing his side pass their first test in making a flying start in the EFL Championship Thomas Christiansen now takes charge of his first cup tie as Leeds United head coach with Port Vale providing the opposition at Elland Road tonight. 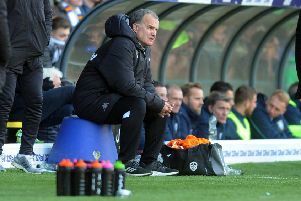 Christiansen’s first home game comes in the newly named Carabao Cup and it will be interesting to see if he chooses to follow the path of his predecessor by naming a much changed line-up to rest the players that battled to a 3-2 success at Bolton Wanderers or whether he sees bigger value in getting a team pattern going with the side he initially thought was best to get the job done. It is more likely he will ring the changes as the cup tie gives the new boss a good chance to assess the strength of his squad in a competitive game as he looks to establish his best 11 long term. Whoever comes in will have to fit in with tactics that appear to have already been laid down with United adopting the same 4-2-3-1 formation they predominantly used last season. There did appear to be more emphasis on attack, however, in the Bolton match compared to away matches last term with more people getting forward into the 18-yard area – as evidenced with midfielder Kalvin Phillips coming up with two goals. Phillips formed a good partnership with Eunan O’Kane in central midfield, but both could be left out of the cup tie as Christiansen will want to see what new boy Mateusz Kilch can bring to the team and Ronaldo Vieira needs game time after being given extra rest following his summer exertions with the England under 20s. Another midfielder, Liam Bridcutt, was left out of the squad all together at Bolton as Leeds have so much strength in depth in his position while winger Stuart Dallas was also overlooked for the game despite decent pre-season displays. All could come in to face Port Vale, while new striker Caleb Ekuban, and likely number 10 Samuel Saiz, unused substitutes last Sunday, are likely to be given a chance to shine. Behind them there are strikers Souleymane Doukara and Marcus Antonsson, who were left out all together at Bolton and did not feature despite being on the bench for the last three pre-season matches. With Leeds at home twice more in the next week as they host Preston North End on Saturday then face one of the promotion favourites in Fulham next Tuesday they face a hectic start to the campaign so Christiansen faces an early challenge with his selections. He was obviously pleased to start with a win last Sunday. He said: “It was a tough game, which I expected, against a tough opponent, and a result I had dreamed of. “We need to recover now and focus on Port Vale in the League Cup. It’s good to start the season like this and now we have a few games at Elland Road where we will have even greater backing from our supporters.